Is it a sculpture or a machine? 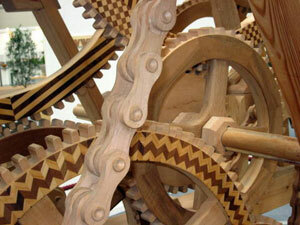 For the past several years, woodworker Erich Schatt of Zurich, Switzerland has used his free time designing and building an exquisite machine built entirely of wood. What exactly does the machine do? Well, mainly it causes people’s jaws to drop whenever they see Erich sitting in the driver’s seat pedaling away on this amazing contraption, spinning the dozens of wooden gears whose movements are intricately intertwined using wooden chains (that resemble the drive chain on a bicycle). It even features wooden universal joints and a wooden transmission. Woodworking has been Erich’s hobby and passion since he was a child. At a very young age, he was already scavenging through condemned houses salvaging timbers and flooring. Some of this beautiful wood he used in his own woodworking. The rest he sold to others to help fund the purchase of new woodworking tools for himself. Old-fashioned joinery and antique furniture continued to fascinate him as he began his woodworking career as a furniture maker and machinist. Eventually he made the restoration of antique furniture his specialty. 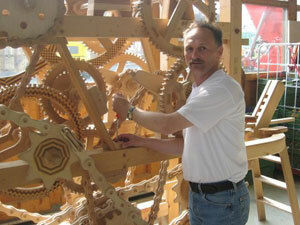 For the last several years, Erich has devoted about six hours of woodworking each Saturday building his machine. It had its genesis in 1998 when his interest in sprocket wheels and chains led him to successfully build a bicycle chain entirely out of wood, a process which required numerous complex calculations to get all the parts to fit together and function correctly. 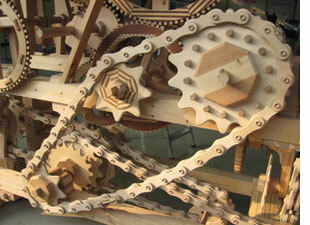 This led to the idea of building a wooden machine which eventually grew to occupy more than 400 cubic feet of space. Using his considerable woodworking skills, he completed the machine in 2002 and successfully exhibited it at the annual convention of the Swiss Sawmill Association in Schaffhausen where it drew considerable interest from members of the timber industry. 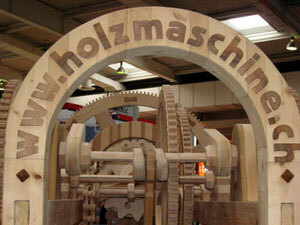 Since then he has continued showing and demonstrating the machine at European conventions and exhibitions. 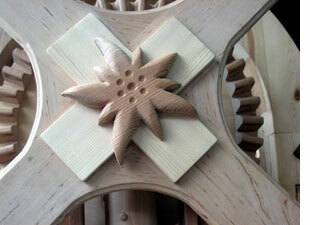 This woodworking machine is of course not the only thing he has built out of wood. Besides furniture of every type, he has also built toys, games, lanterns, attache cases, a guinea pig stable and six-foot model of an American truck. He has turned down offers from people who want to buy the truck. Instead he hopes to complete a second trailer for the truck equipped with two chambers from which red and white wine can be dispensed at company celebrations. Erich never lacks for ideas. He is already underway building a second machine, which though not as large as the first, will be considerably more intricate, featuring a planetary gear system nearly three feet in diameter. 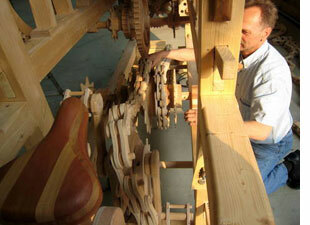 It is driven similar to the first machine using a wooden chain. The operator sits on a wooden saddle which slides backwards and forwards along “a swallowtail butterfly guide rail.” He expects it will take another three years of woodworking before it is ready to exhibit.